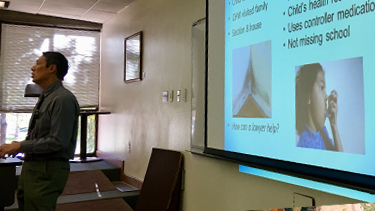 Dr. Andrew Hsi of the Institute for Health, Resilience, and Justice at the UNM Health Sciences Center spoke during a Social Justice Lunchbox event on November 8th about the deleterious life-long effects of Adverse Childhood Events (ACEs) and other health harming legal needs. Some of the health needs that can be addressed by legal intervention include: food insecurity, unemployment, discrimination, poor housing or homelessness, family violence, and environmental threats. An example given was that of a child with poorly controlled asthma who had proper medication administered properly, but who was wheezing more at home. Upon a home visit by child health workers black mold was discovered in the Section 8 housing. Hsi described how an attorney in this circumstance could advocate for the family to be moved to a healthier home without loss of benefits, thus resolving the acuity of the child’s asthma. Law student and member of the Student Health Law Association, Oksana Vivchar, said, after hearing about the poor outcomes for children in New Mexico, “I was surprised by the early use of drugs and alcohol in our state.” Hsi informed the audience that a very high number of regular users of alcohol and cigarettes here started at the age of 10 to 11 years old. New Mexico also has the 5th highest rate of teen pregnancy in the nation. The next program will be presented on Environmental Justice by attorneys from the New Mexico Environmental Law Center, on January 17, 2018 at noon in room 2405. Snacks and water are provided and attendees are invited to bring their lunch.